People marketing is the biggest untapped opportunity marketers have to drive success for their organisation, Mercer’s global CMO claims. 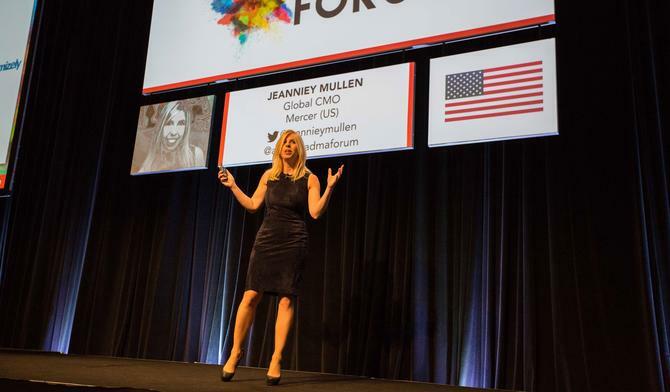 Speaking at the ADMA Global Forum in Sydney, the financial services group’s Jeanniey Mullen said the line between marketing and HR functions is blurring because brands need to more actively involve employees in building their brands. “We live in the age of brand equalisation,” Mullen said. “Your brand name doesn’t matter online as much as the brand experience. To survive and thrive in a digital world, brand is about building advocates... unlike any other. Mullen pointed to a recent report outlining four key pillars required to build sustainable businesses today. The first is ‘growth by design’. “If that doesn’t scream hey marketer, we need you at the executive table playing a strategic role in the way we grow, then I don’t know what else does,” she said. The second trend is the shift in consumer values. In turn, today’s employees increasingly want to work for a brand they can believe in and that has purpose. The fourth pillar is the ‘quest for insight’. “Not only are we looking for insight, data and trends on how our campaigns and efforts are performing, our employees are looking for insight and trends about their performance as well,” Mullen said. To fuel people marketing, Mercer has adopted a three-pronged approach it has coined ‘AIR’ – authentic, inspirational and reliable. As an example of authenticity, Mullen said marketing is putting campaigns in front of staff first and encouraging them to collaborate. “We are learning interesting ways to improve what we take out externally as a result,” she said. “The average person reaches 25,000 people on social networks over the course of the year. Every message put out on your company’s behalf should be considered a marketing moment. In Australia, Mercer's local marketing team recently shared its new brand campaign, ‘A different kind’, with staff four weeks ahead of launch externally in order to collect feedback and encourage contributions. The campaign also involved actual clients. Collateral related to each client was put in focus for one week at a time. In the final week, the content was wrapped up and shared with employees. Mercer also dressed up the offices, used digital signage, and even dropped flyers on desks encouraging staff to download the app and watch a 3D message from the CEO talking about how people played a key role in differentiating Mercer in the market. Internal chatter and sharing extended to social when the campaign went live. “Our people were authentically sharing their excitement and passion for Mercer - it was pride,” Hinton said. As an example of inspiration, meanwhile, Mullen’s team ran a virtual career fair aimed at both articulating the strategic role marketing is playing in the organisation, as well as actively filling gaps in functional capability. Different marketing teams were asked to put together a two-minute video explaining what their teams did. In total, 1300 offices dial in, with more than 14 per cent of organisation tuning into the marketing career fair. Off the back of the event, 75 people in Mercer applied for jobs in marketing who didn’t work in marketing, while others were offering 20 per cent of their time to help or learn new skills, Mullen said. Mullen’s people marketing ambition is one of four core strategic pillars she has devised in order to shake up Mercer’s marketing and customer engagement approach. Mullen took up the global CMO post four months ago but spent the previous 18 months leading an innovation team internally tasked with launching new forms of products. Before joining Mercer, she spearheaded a number of technology startups, and she’s also previously worked on the agency side. The first problem Mullen identified was that Mercer’s marketing was operating as a centralised function disconnected from localised teams and business units. The second, big ambition for Mullen is decentralisation of digital as a standalone function to ensure digital becomes a key component to every function and role across Mercer. Historically, digital has been a centre of excellence within the company manned by a specialist team. While marketing today relies on the same strategic thinking, Mullen said digital presents a different way of execution. “As marketers, we need to collaborate with IT and the CEO to create effective marketing strategies across the board,” she said. Mercer also launched Mercer Digital in July, a newly integrated business providing digital solutions that are designed to empower the workplace of the future. In addition, the company has done a series of acquisitions and partnerships to improve its digital clout, including its partnership with digital financial advice solution provider, Decimal Software. Mullen’s third key pillar is to ensure people marketing becomes entrenched in the organisation, and she’s realigning the business to ensure this happens. For example, there is now a dedicated head within the global communications team tasked with leading people marketing. Mullen noted a lot of Mercer’s employees in finance, actuarial services and business lines have been with the organisation for many years. Bringing them on-board to help foster brand values and actively contribute to marketing is vital. The fourth pillar of her transformation plan is to better align marketing with sales, another gap she saw at Mercer. One way Mullen is striving to overcome this is by upending the traditional concept of account-based marketing to focus on key accounts not actively engaging with the brand and are at risk of churn. “Rather than look at those who have come to the site in the last 30 days, for example, what I’m interested in is who hasn’t been to the site from our key account list as those are the ones that represent a retention issue,” she said. Read more about how Mercer's Australian team is tapping customer insights to fuel marketing success here.